Shop online for over 300 micro-structures model trains at discounts up to 34%. Roadway is the most popular of the 7 micro-structures model trains categories, then Lighting / Electrical, and Buildings. This is the Power Distribution Board from Micro-Structures. This is the Pensacola Beach Animated Neon Christmas Ornament from Micro-Structures. 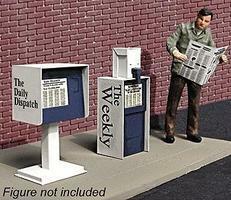 This is the City Details Newspaper Stands pkg(2) in HO-Scale by Micro-Structures. 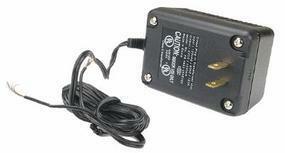 This is the AC Power Adaptor (4.5 Volts) from Micro-Structures. Runs up to 10 Signs (Sold Separately). This is the Esso Animated Neon Billboard from Micro-Structures. Small for HO & N Scales. 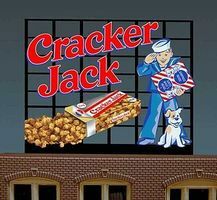 This is the Cracker Jack Animated Neon Billboard - Light Works USA(TM) - Small for N/HO Scales from Micro-Structures. 2-5/16 x 1-5/8" 5.8 x 4.6cm. 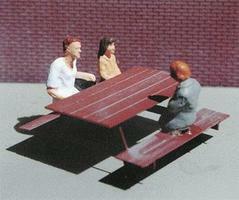 This is the Picnic Tables Etched-Metal Kit in N-Scale (4) from Micro-Structures. 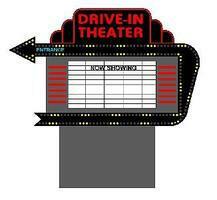 This is the Drive-In Sign kit from Micro Structures. 4-5/32 x 4-13/32'' Suitable for HO & O Scales. This is the Animated Neon Billboard of Pensacola Beach, Florida from Micro-Structures. Large for HO/O Scale 4-1/4 x 2'' 10.8 x 5.1cm. This is the Budweiser Animated Rooftop Billboard - Small for N & Z Scales Lattice Support from Micro-Structures. Size 1 x 1-3/8" 2.5 x 3.4cm. This is the Motel Animated Neon Billboard - Light Works USA by Micro-Structures. Large for HO & O Scales 5 x 6'' 12. This is the Patriot Flag Co. Animated Neon Billboard Kit from Micro Structures. 1-1/2 x 2-5/16'' 3.8 x 5.9cm. This is the Billboard Support Kit Micro Structures. This is the N Scale PARKWAY DINER from Micro Structures. This is the New York Central System Animated Neon Billboard from Micro-Structures. Large for HO/O Scale. This is the Planters Peanuts w/Mr. Peanut Animated Neon Billboard from Micro-Structures. Small For HO/N 2 x 2-1/4'' 5.1 x 5.7cm. This is the NAPA Auto Parts Underlined Logo Flashing Neon Window Sign - Light Works USA by Micro-Structures. This is the Left Arrow Animated Multi-Graphic Lighting Kits w/Overlays from Micro-Structures. This is the City Details Garbage Cans pkg(2) in HO-Scale by Micro-Structures. This is the Salvation Army Animated Neon Billboard from Micro-Structures. 5 x 3-7/8'' 12.7 x 9.8cm.